Even though we have a little thing called The Greatest 3-Minute Top Ten Lists Ever, we feel inclined to tell you about something our pals are up to tonight. 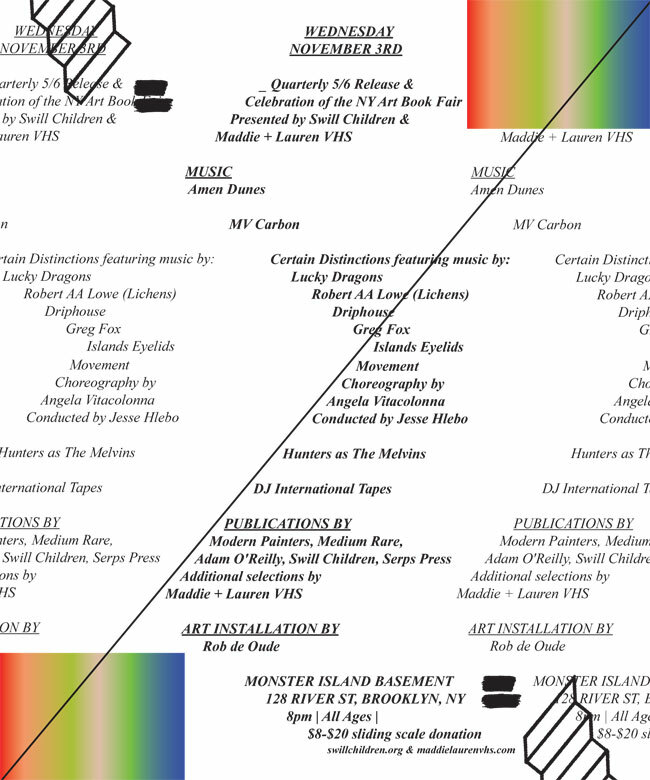 Swill Children will present Certain Distinctions, a multi-sensory performance based on the structure of a gradient featuring choreography by Angela Vitacollona, garment design by Mara Sloan and music by Lucky Dragons, Robert AA Lowe aka Lichens, Greg Fox, Driphouse, and Islands Eyelids. The event will be conducted by Jesse Hlebo. Music performances throughout the evening include Amen Dunes, MV Carbon, Hunters playing songs by The Melvins, and DJ International Tapes. Local and international publishers including Modern Painters magazine, Swill Children, Medium Rare, Adam O’Reilly, Kingsboro Press, Neal Reinalda, and Serps Press will have new titles for sale. Additional publications and artist’s projects selected by Maddie + Lauren VHS will be featured as well. Swill Children also announces the release of _Quarterly Issues 5 & 6, featuring writing on musical notation from Jason Diamond, Lewis Kopenhafer, Justin Sloane, and others, as well as a mixture of appropriated imagery culled from NY and LA public libraries. Issue 6 is a collaboration with NYC based publication Showpaper including newly commissioned work from Grant Willing, Katja Mater, Arthur Ou, and Borden Capalino. A site-specific art installation by Rob de Oude will be in the basement backroom, presented by Maddie + Lauren VHS.